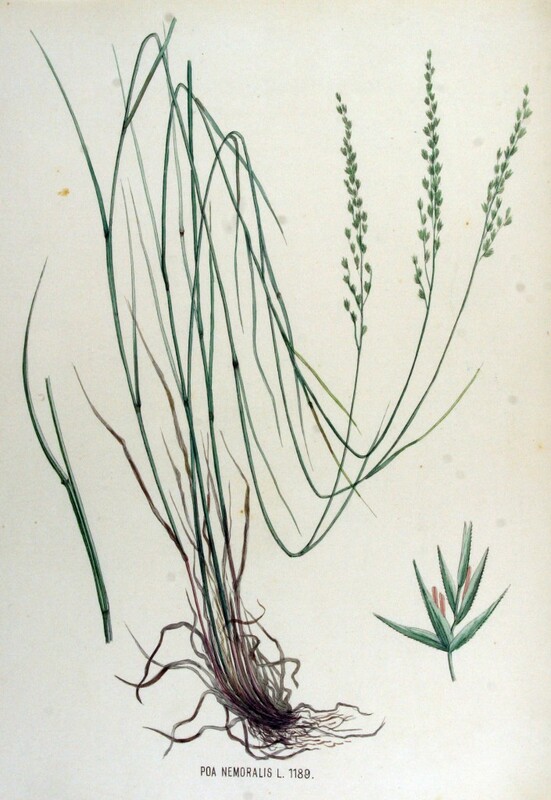 Poa nemoralis is a perennial about 50 cm tall, slender, tufted. Leaves 0.1-0.2 cm wide, some above middle of stem, upper blades about as long as lower, leaf tips boat-shaped, ligule about 0.5 cm long. Flowers spikelets on outer half of branch, about 3 flowered, lemmas with 3 hairy veins, webbed at base; inflorescence lax, about 5 branches per node; blooms May-June. Habitat: Margins, open woods, roadsides. Somewhat shade tolerant. Notes: Plants and seeds eaten by birds and mammals (Martin et al. 1951).